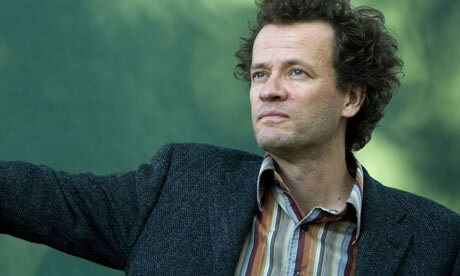 Yann Martel: Author of Life of Pi! So, I finished reading The Life of Pi.......Again, and this book never ceases to amaze me. When I started the discussion on this book with my students, we talked about the narrator saying that "This book will make you believe in God." We talked about the faith spectrum with atheism at one end and very faithful at the other end. The students asked "Don't you ever have days when you think the whole day was awful?" and I said "No." Then they asked me a whole lot of other questions, and they came to the conclusion that I am fanatically faithful. (Really!) But, most saw themselves in the middle between atheism and faithful. Life of Pi is a book that WILL make a person think about his/her faith. "If Christ Played With Doubt, so must we. If Christ spent an anguished night in prayer, if He burst out from the cross, "My God, my God, why have you forsaken me?" then we are also permitted doubt. But we must move on. To chose doubt as a philosophy of life is akin to choosing immobility as a mean of transportation. "Things don't turn out the way they were supposed to, what can you do? You must take life the way it comes at you and make the best of it." "I must say a word about fear. It is life's only opponent. Only fear can defeat life. It is a clear, treacherous, adversary, how well do I know. It has no decency, respects no law or convention, shows nor mercy. It goes for your weakest spot, which it finds with unerring ease. It begins in your mind, always. One moment you are feeling fine, calm, self-possessed, and happy. Then fear, disguised in the garb of mild-mannered doubt, slips into your mind like a spy." "I should not count on outside help. Survival had to start with me. In my experience, a castaway's worse mistake is to hope too much and do too little." People, if you want a good story about the "The Will to Live," "The Power of Religion," and "The Nature of Truth," read The Life of Pi! It is at the top of my LONG list of favorite books!